At first, this fine salsa didn't look new to me. Not completely. I felt like it had been well-established on TJ's shelves for years and years. Yet it was being marketed as "new." Nearly nine years ago, we looked at this salsa's predecessor on this blog. Back then, it wasn't organic. At least not certified organic. This new stuff has the seal of approval from Quality Assurance International. Conspiracists will tell you that the New World Order will be rolling out a single world government, a single world currency, and a single world religion. I'm pretty sure QAI will be the folks responsible for planning the single world menu for all work, school, and dissident camp cafeterias. Or maybe they just make sure stuff is really organic when people say it's organic. Either way, we'll just have to trust them. And I do. My gut tells me this salsa's organic. It just tastes and feels fresh and invigorating somehow. Sonia said the exact same thing upon first bite without any prompting from me. It's also bold. Where its predecessor was simply "chunky," this product is thick and chunky. It's like if that previous incarnation were the mild-mannered mortal version of the product, then this is the post-spider bite/science experiment gone horribly wrong/exposure to radiation superhero version of the salsa. It's got nice big pieces of tomatoes and peppers, and some onion bits are visible as well as tastable. There's some garlic flavor and juuust a hint of flavors like vinegar and salt. It's a well-rounded tomato-based salsa in almost every way. We're dealing with half a chili pepper on the spice-o-meter, which means it has enough heat to scare away wusses and crybabies (no offense, spice-o-phobes) but not enough to administer searing pain to all who partake. I'm pretty happy with the spiciness here. I don't know if things are starting to bloom out here in the southwestern desert, or whether its the drier climate or higher amounts of dust in the air, but Sonia and I both need a little spice to open up our sinuses lately. 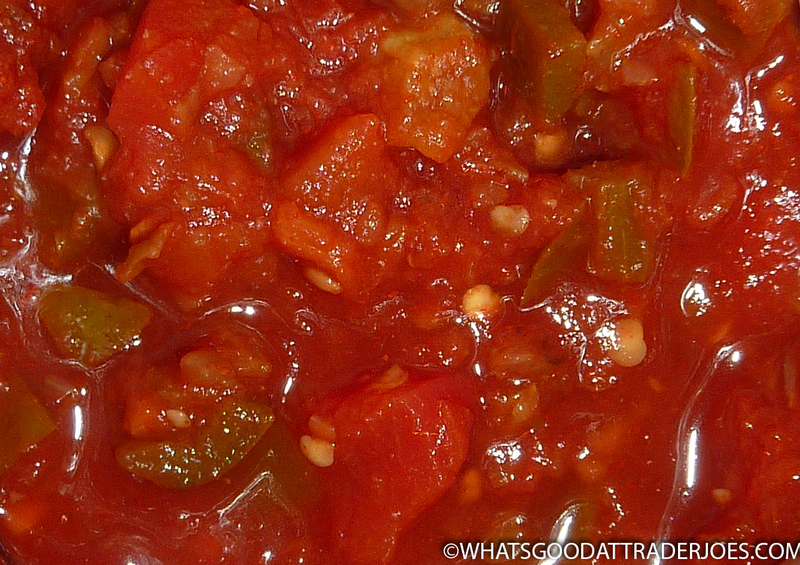 Somehow, salsa just tastes better in the southwest. 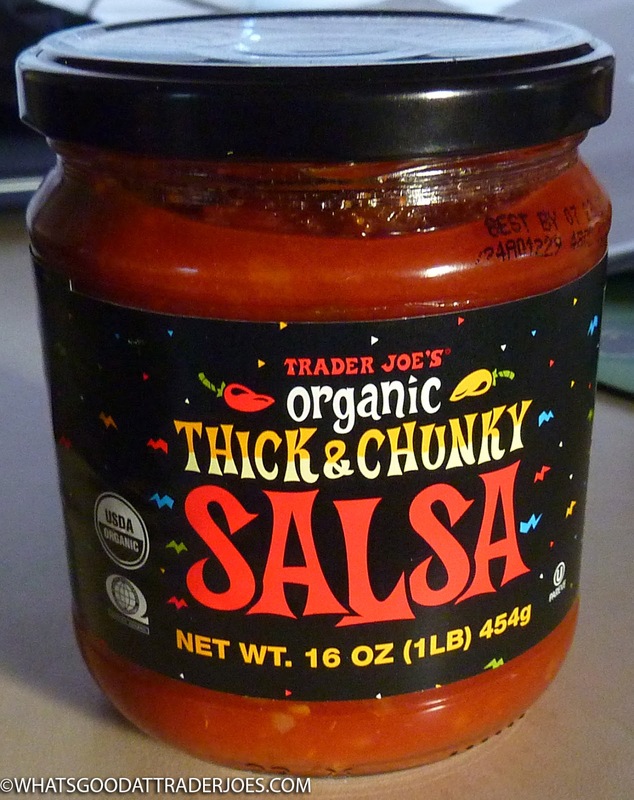 Anyway, if the original version of this salsa made our Pantheon, then this organic version most definitely will also. It pairs nicely with another recent addition to our best of the best category—but then again, those dippers pair up with just about anything pretty well. Both are very tasty products. 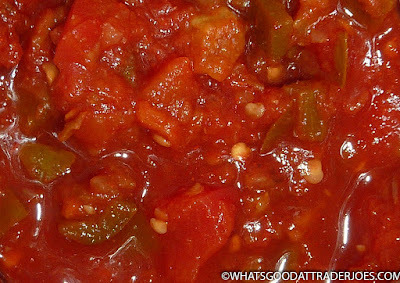 Closing thought: this salsa's only $2.49! How is that even possible? Bottom line: 9.5 out of 10. Wow! Back to back winners! I am a total wimp but there are a few of TJs mild salsas that i can handle so I’ll certainly try this given your high praise. And organic for 16oz $2.50?? That’s newsworthy- I can’t buy one organic tomato for $2.50 at other stores!